The Anomolies Part 1, and Part 2 - May 2003: Wow, has it really ben 3 years since we added a new freestyle here? Well here's a double dose from Helixx, Big Tara, and Pri the Honey Dark of the Anomolies, plus a cameo appearance by DJ Kuttin Kandi. Shuman - April 2000: A session from one of Boston's top up and comers, Shuman. Moodswingas - July 1999: 12 minutes from the Moodswingas, live on the Underground Railroad. Turntables manned by DJ 3D. Natural Elements - May 1999: The Mighty Mister Voodoo and L-Swift rock live at HMV, with our own DJ Emskee on the wheels. DJ Spinna featuring Eminem and Thirstin Howl - January 1999: Straight from the studio here's an exclusive track from DJ Spinna's upcoming release on Rawkus. Talib Kweli, Jah Born, Cash Rule and DCQ - October 98: This is sort of like Medina Green with Kweli instead of Mos Def. Our first classic freestyle since we moved to Wall Street, with Spinna on the wheels. 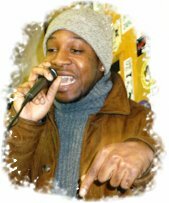 Allstar Freestyle extended version - December 97: Here's 25 MINUTES more of our historic freestyle marathon with Mr. Live, Tony Bones, IG Off and Hazadus, Kwest the Mad Lad, Poison Pen, A.L. Skills, Skam and Shadowman, and the Doxxmen. I.G. Off and Hazadus with Skam - November 97: One of the best freestyles I've ever heard, with DJ Spinna destroying the wheels. A Tribe Called Quest - June 96: 8 Minutes straight off the top. Das Efx with Mr. Voodoo - November 93: The Hit Squad meets the Natural Elements crew. Truly a Classic. A.L., Mazzi and Icon - Summer 97: Mazzi, Icon, and Unsigned Hype winner A.L. flow for 21 minutes. The Jigmastas, Building Blocks and Jet Black Hah - November 97: Of course the Railroad is the official home of the Beyond Real crew. Kiama - July 97: A dope unsigned MC with beat box accompaniment by Click the Super Latin. King T with Xzibit - Winter 95: Possibly Xzibit's first NY radio performance? Mister Voodoo - 1992: Did you know Voodoo got his start as J Smooth's intern on the Railroad? This is his very first rhyme on radio, when he was still known by his real name, Agu. Naughty by Nature - Spring 95: Treach and Vin Rock are joined by Love Child of Cali's Road Dawg crew. Organized Konfusion - September 97: Pharaoh and Prince Po herald the arrival of their new album "The Equinox". Skam, Building Blocks, and Jay Smooth - November 97: From the same session as that Jigmastas clip. Wutang Clan - Early 93: One of the clan's first radio appearances. OK, these are not from my show,but I won't tell if you won't tell. Eminem and Royce - September 98: A nice long peek into the mind of two lunatics with Stretch on the wheels. Big L - August 98: We love Big L cuz he represents Lenox Avenue, birthplace of our webmaster. Del - 1995? : Thanks to the listener who donated this file from the Heiro MVP, I'll put your name up in a minute. Black Moon - July 98: Buckshot and 5 F.T. are back together with a new album in the works, although for legal reasons their not known as black moon anymore. Herb Mcgruff - July 98: Here's another one of Big L's old friends blowing up, just like Mase and Cam'ron...how come they never have Big L on their records? Craig G vs. SuperNatural - April 98: Who do you think won this round? let me know. Biggie Smalls - The classic rhyme from Mister Cee's crib. Biggie with Tupac - Another well known freestyle from Madison Square Garden. Biggie with Lord Tariq and Pudgee - this is from Pudgee's album that never came out. Biggie Outtake - This is really rare, the original version of Me and My B@#ch, never heard because the sample didn't get cleared. KRS-One with Common - Late 97: If anyone knows who Common was dissing in this verse let me know. Bizmarkie and TJ Swan - probably 1987: Here's a nice historical artifact from the glory days of the Juice Crew on WBLS. Boot Camp Clik - 1995: This is from a little show on WKCR hosted by some guys named Stretch and Bobbito. The Roots - 1995: From 89.9, the same night as that Boot Camp Joint.